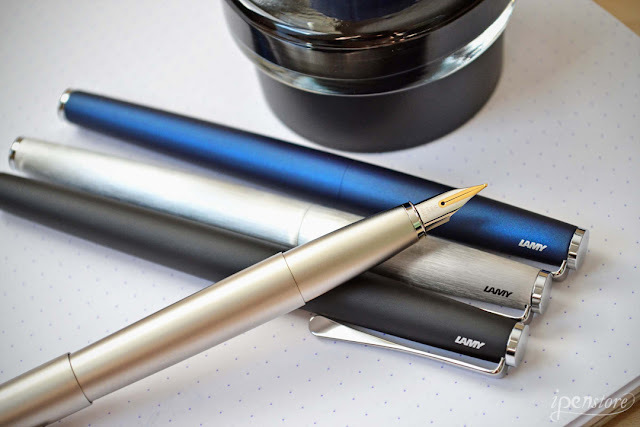 Have you considered a Lamy Studio fountain pen for your collection? The Lamy Safari and AL-Star are very popular pens, but if you're looking for an upgrade, this is a great choice. There are a lot of reasons to love this pen! This pen, like other Lamys uses cartridge or converter. The pen has a sleek, minimalist design with a metal body and a snap on cap. It comes packaged in a nice looking yet environmentally friendly cardboard box. Inside you will find a cartridge, and an Lz26 converter, and a Lamy product booklet. The stainless steel finish has a brushed and slightly textured which helps prevent fingerprints. The grip section is smooth and feels slightly rubberized so your fingers will not slide. The pen has a nice weight to it and is not too heavy for a metal pen. It feels very balanced both posted and unposted when writing. I really love the clip on this pen. It's designed to look like a propeller so it has a modern twist to it that makes it really different looking. The pen is sleek with a slight taper at both ends. The top of the cap and the end of the pen have a simple shiny silver disc that adds to the contemporary look of this pen. 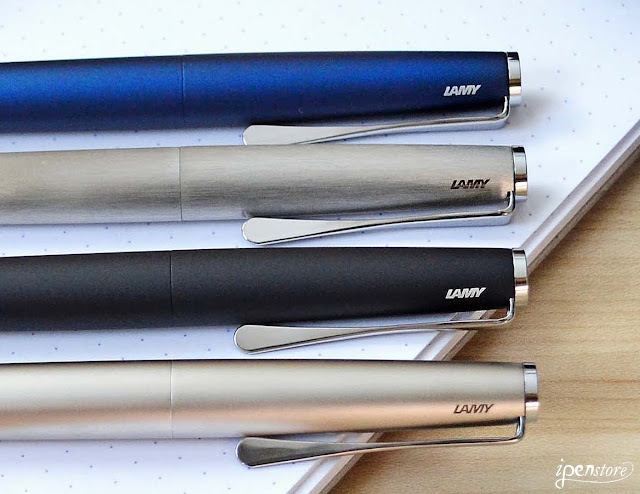 Lamy nibs are interchangeable and share the same nib as the AL-Star and Safari. You can purchase many sizes including EF, F, M, B, 1.1, 1.5, 1.9, and LH. The two toned 14K gold nib comes in EF, F, and medium. The gold nib provides a little give, and is incredibly smooth. 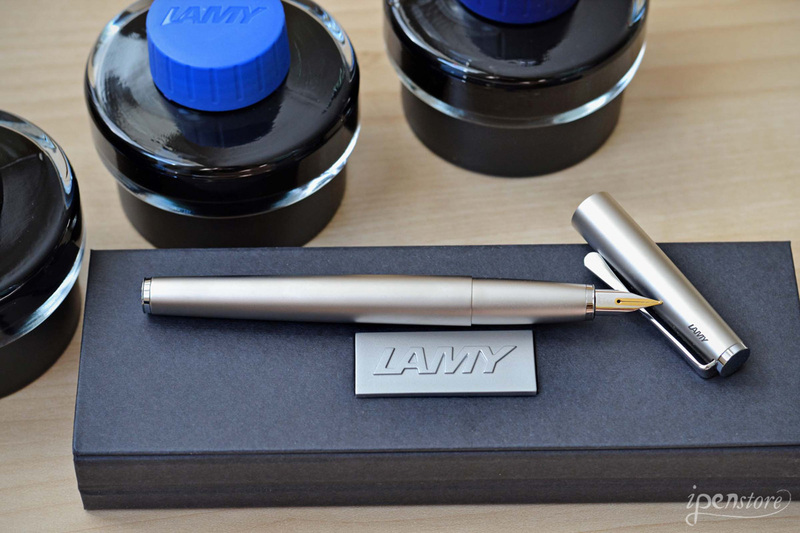 We love the Lamy Studio Fountain Pen. 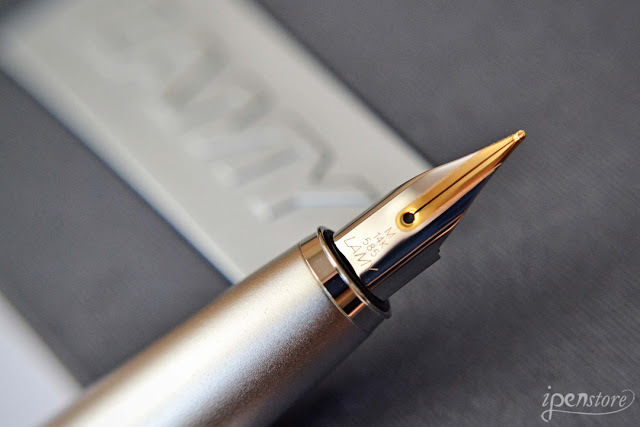 It's a nice step up from the popular Lamy Safari and AL-Star and has so many great features the pen is a winning choice for your fountain pen collection!